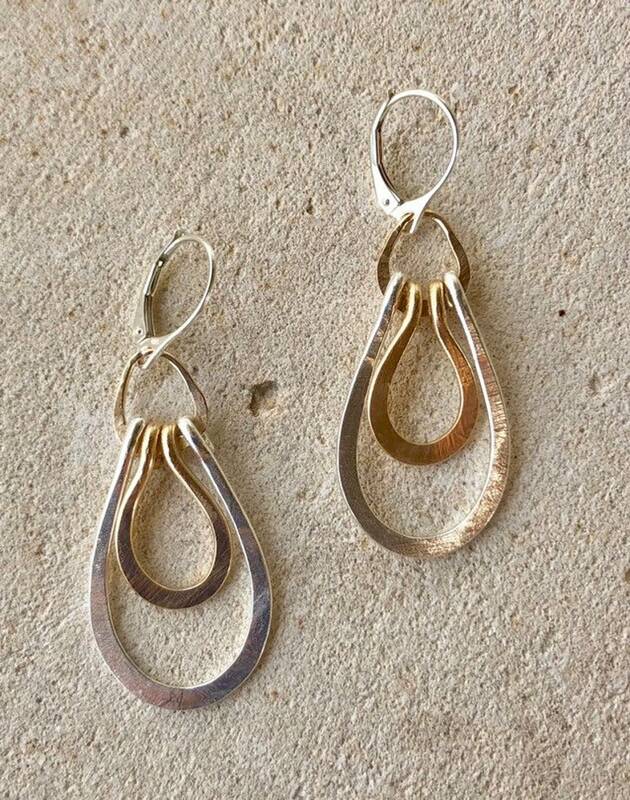 All hand forged, these double teardrop earrings incorporate for Sterling silver and 14k Gold filled wire so that they can match most of your other jewelry. They shimmer and sparkle in the sunlight and are lightweight and beautiful. Versatile and elegant, contemporary and bold! I hung them on sterling silver lever backs from Rio Grande for security and a more professional finish. Please allow 5 business days before I ship your earrings, but I always try to mail them sooner. Gold-filled is NOT the same as gold plating (which has a minuscule layer of gold applied to brass and wears off easily). Gold fill contains 100+ times more real gold than gold plated components and are very durable and tarnish resistant. Gold filled jewelry is a beautiful, affordable alternative to solid gold, and can be worn by people with sensitive skin. These earrings arrive tastefully packaged for you to present as a gift to someone you care about . . . or to yourself! I take pride in my work. If you receive an item from BeAMaGiKLaMP in anything but excellent condition please notify me and I will make arrangements to repair or replace accordingly. The silver and gold earrings are absolutely beautiful!! The quality is outstanding!! Nicely packaged, too. And I appreciated the polish cloth, not to mention the seller's personal note! If this wasn't a Christmas gift, I would keep them for myself. I will definitely be ordering another pair for myself. Thank you so much!! Just as pictured! I love it! Easy communication and delivery quick. I received my ring today and I couldn’t be more happy with it! It’s beautiful and fits perfectly. Eileen engraved it exactly as I had requested. It took no time at all for me to receive it. Very, very pleased with my purchase. Unless the item is already made, all our pieces are made for you once you place your order. I do my best to get most made to order items into the mail within 2-5 business days of your placing the order. I often can ship them even sooner, but much depends on supplies in inventory. If you must have an item quickly please convo me to ensure I can do so and be prepared to pay extra for shipping faster than USPS First Class Mail. BeAMaGiKLaMP sells many of the items in this store at wholesale prices for wholesale buyers. Contact me to shop wholesale.